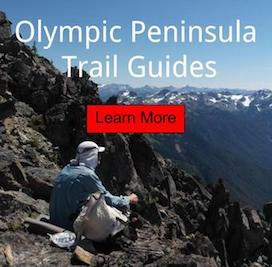 Hiking up the Heather Park Trial in the Olympic National Park is quite the adventure. The path leaves you wondering whats around each corner. Offering challenging grads for a hiker wanting to get in shape for a big trip or just looking for a good workout. One often will turn around at Half Way Rock, because the body isn't willing to follow the heart to the top to Heather Pass. Walking this trail gives you a real sense of accomplishment by the end of the day, even if one does not make it to the top. Starting near Heart O'the Hills Campground, the trail ascends the base of Mount Angeles, leading you on the shoulder of First Top, then near Second Top and finally to Heather Pass. These land features are all connected to Mount Angeles. A climber might refer to them as false summits of the main mountain. It is suggested that a person wait for the snow melt in late spring before hiking this route. The path leads you through at least three steep avalanche shoots and can be hazardous to a inexperienced hiker without the skills needed to read snow quality. Spring wildflowers make it worth waiting as well. One can get a view of a lifetime after ascending to Heather Park Pass. World class views that rival any that the Park has to offer. Strait of Juan de Fuca, Mount Baker, San Juan Islands and the full interior of the the Olympic Mountains can be seen. The cities of Port Angeles, Victoria and Sequim can be viewed as miniature town sets for the gods. Come along on this journey with photography.